Today when you eat a piece of chocolate or sip a steaming cup of hot chocolate, you are probably not considering the history of chocolate, which is long and storied. While the modern day chocolate bar is sweet and enticing, it is a far cry from its ancient ancestor, a bitter drink that was consumed by the peoples of Mesoamerica (modern day Mexico and Central America). The ancient Mayans are known as the first to discover the cacao bean during the Classic Period (250-900 C.E.). They took the tree, which grew prolifically in the rainforest and transplanted it to their backyards where they invented processes to harvest, ferment, roast and grind the seeds into a paste.The Mayans then mixed this paste with water, chile pepper powder, cornmeal and other ingredients to make a frothy, spicy, bitter drink. It was considered a drink of the gods, one that was cherished by young and old alike. Approximately 500 years after the Mayan empire discovered chocolate, the Aztec empire came to dominate Mesoamerica. By 1400 they were trading with the Mayan people for cacao beans, which was so treasured that it became a form of Aztec currency. They too drank the bitter chocolate mixture with spices and also used the cocoa beans in rituals. The beans were used as money, used to purchase gold, slaves, clothing or food. Unlike Mayan society, where anyone from any class could consume chocolate, the Aztecs reserved the brew primarily for rulers, priests, decorated soldiers and honored merchants. Priests also used cacao seeds as offerings to gods and served chocolate drinks during rituals and ceremonies. The Spanish "discovered" chocolate when they colonized the New World and ultimately introduced it to Europe. Those who discovered this beverage weren't exactly fond of it, considering it "better to be tossed out to pigs than drunk by men." But this attitude changed when someone had the idea of adding sugar. There is no one person credited with the discovery of adding sugar to chocolate. Some attribute it to nuns living in Oaxaca who replaced the chile pepper with sugar. This sweetened version was incredibly popular among the Spanish creoles. The conquistadors eventually spread the news of this new drink back home in Spain. King Charles V served it to his courtiers in 1527, but chocolate did not provoke much enthusiasm until 1585 when the first cargo of cocoa beans was shipped from Veracruz to Spain. By the end of the 16th century hot chocolate was in vogue and people drank it morning, noon and night. In other areas of Europe, chocolate also became a popular drink. It was widely consumed in Venice and Florence by the end of the 16th century and imported into Germany in the middle of the 17th century. 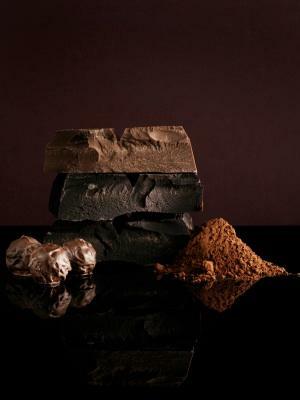 Chocolate was fashionable in France under Louis XIV, particularly after his marriage to Maria Theresa in 1660. She had acquired the habit of drinking chocolate in Spain. Under Louis XIV chocolate consumption spread and its popularity grew across Europe and cocoa bean imports continued to rise. Chocolate remained a handmade and relatively expensive luxury in Europe for many centuries. However, by the 1880s the inventions of the Industrial Revolution made mass production and solid chocolate candy affordable to a much broader spectrum of the population. The steam engine made it possible to grind cacao beans to produce large amounts of chocolate and make it extremely inexpensive. Other industrial processes, such as the cocoa press and conching machine made it possible to create smooth, solid chocolate for eating. It was not just for drinking anymore. In the early part of the 19th century Conrad Van Houten succeeded in separating cocoa powder from cocoa butter, which led to a major improvement in the quality of chocolate. This invention turned the Netherlands into a major chocolate supplier. It was Switzerland that built the first chocolate factory. This factory was quickly followed by others built by famous modern names of Lindt, Tobler and Nestle. In the 1870s the latter two companies perfected a process for manufacturing milk chocolate. By this time chocolate was no longer regarded solely as beverage. More of it was consumed in the form of solid tablets, and various types of candy. Worldwide production rose from 10,000 metric tons in 1830 to 115,000 in 1900. Today cacao production hasn't changed much since ancient times. While new processes and mechanization have improved the ability to farm chocolate and the speed at which it is produced, the farming processes remain basically unaltered. It is still mostly harvested, fermented, dried, cleaned and roasted by hand. The key difference today is that about two-thirds of the world's cocoa production is in Western Africa with about half the total sourced from the Cote d'Ivoire. This cacao provides billions of consumers with an incredible variety of chocolate candies, as well as baking chocolate for professional chocolatiers and pastry chefs. It is now used to make delectable confections such as homemade milk chocolate, chocolate frosting, and lovely chocolate truffles.